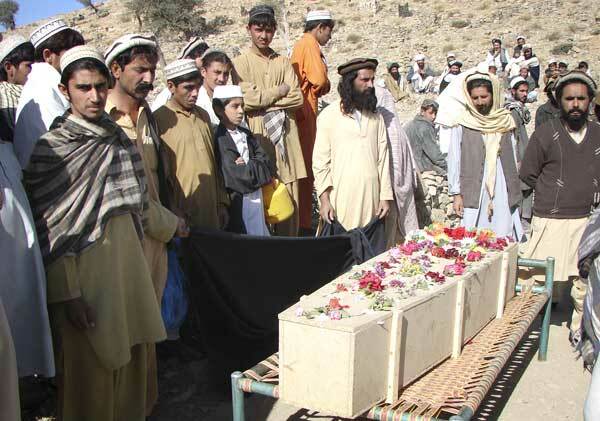 Burial in town of Miran Shah, Pakistan, November 19 for victim of U.S. drone attack in nearby village that killed six people. Another U.S. strike killed eight people in area on following day. Miran Shah is capital of North Waziristan in Pakistans Federally Administered Tribal Areas. White House seeks to expand drone attacks beyond tribal areas to Balochistan Province. December 8To complement Washingtons 30,000-troop increase in Afghanistan, the White House has authorized an expansion of aerial drone strikes in Pakistan. According to the New York Times, Washington is pressing Islamabad to consent to U.S. strikes in Pakistans Balochistan Province, south of the tribal areas the CIA has targeted since 2004. Washington markedly stepped up drone strikes in August 2008. They continued apace after Barack Obama was elected president and expanded to new regions within the Federally Administered Tribal Areas (FATA). But thus far they have seldom occurred outside the FATA. In November 2008 and March 2009 the CIA conducted strikes in Bannu District, just east of the official tribal areas. The inevitable civilian deaths and disregard for Pakistans sovereignty have fomented popular opposition to the U.S. government. As a result, the Pakistani government and military are critical of the U.S. strikes in public. It is widely reported, however, that they tacitly support and provide intelligence for them. At the same time, Washington has denied requests by Islamabad for direct access to aerial drones. The Pakistani government is embroiled in a U.S.-backed war on its own soil against the Taliban Movement of Pakistan (TTP) and allied Islamist groups. But it has shown no inclination to move against other Taliban enemies of Washington in Pakistan that dont challenge Islamabads authority. This includes the Afghan Taliban, whose leadership Washington insists is based in and around Quetta, Balochistans provincial capital. From there, U.S. officials say, the Taliban plan and direct attacks on U.S. and allied forces in Afghanistan. The Afghan Taliban is made up of forces led by Mullah Mohammad Omar that controlled most of Afghanistan before the 2001 U.S. invasion. The Taliban movement was molded and backed by the Pakistani government in the early 1990s. It was used as a proxy to contest, primarily with India, for influence in Afghanistan during the chaos that ensued following the defeat of the Soviet invasion there. The Pakistani government also helped prop up pro-Taliban parties in Balochistan as a counter to Baloch nationalist movements. Pakistani officials have repeatedly denied any knowledge that Omar or other Afghan Taliban leaders are currently in Balochistan. Islamabad could be reluctant to break its connections to the Afghan Taliban at a time when the Indian government is deepening its economic and diplomatic ties in Afghanistan and the outcome of the U.S.-led war is uncertain. It may also be concerned about unintended consequences U.S. operations could have in Balochistan. In southwest Pakistan, Balochistan is the countrys largest, but most sparsely populated province. While Pashtuns from Afghanistan and northwest Pakistan make up a majority in Quetta, the rest of the region is dominated by Balochis, an oppressed nationality in Pakistan and Iran. Pakistani forces have put down five Baloch rebellions there since the country was founded in 1947. A lower-level insurgency continues to simmer. Mass strikes and protests erupted throughout the province in April against the killing of three nationalist leaders by government forces. Baloch representatives have demanded the government release or provide information on some 1,000 disappeared persons. The Pakistani government has promised to release 20 Baloch leaders and is hashing out a Balochistan package that promises Balochis greater autonomy and control over the regions natural resources. Most Baloch leaders, however, have repudiated the proposed legislation. Meanwhile, as many Taliban flee Islamabads offensive in South Waziristan, Pakistani air strikes and ground battles have spread to other tribal agencies including Kurram, Orakzai, Khyber, Mohmand, Bajaur, and Lower Dir. Areas of South Waziristan have been leveled and more than 400,000 people have fled eastward. Most are largely left to fend for themselves, relying on charity from Pakistani residents in the nearby North West Frontier Province. In response to the offensive, the TTP and its allies have organized a stepped-up campaign of terrorist bombings and attacks outside the tribal areas that have killed nearly 500 people. The TTP claimed responsibility for a December 4 assault on a mosque in Rawalpindi used by military officers and their families. The attack killed 40 people, including 16 children, and injured more than 70. Such tactics are fueling growing hostility to the Taliban, al-Qaeda, and other Islamist military formations in Pakistan. In recognition of this fact, the TTP leadership has sought to distance itself from some of the deadliest civilian attacks, spreading conspiracy stories that they are the work of U.S. mercenary company Xe Services and Pakistani intelligence.